This is the real deal in reggae drumming. 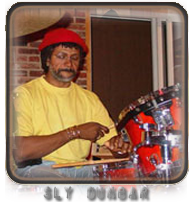 As half of "Sly & Robbie," reggae s premier rhythm section, Sly Dunbar has appeared on records by legends such as Bob Marley, Peter Tosh, Jimmy Cliff, Black Uhuru and Burning Spear. He has also played with non-reggae artists such as Grace Jones, Mick Jagger, Bob Dylan, and Herbie Hancock. His latest work is in the classic "Dub" style. SlyPack I is for those who want authentic reggae and classic ska drums. From its light and playful hi-hat figures to the snare drops and ghost notes, this groove pack captures the sounds of a true Jamaican "riddim" king.